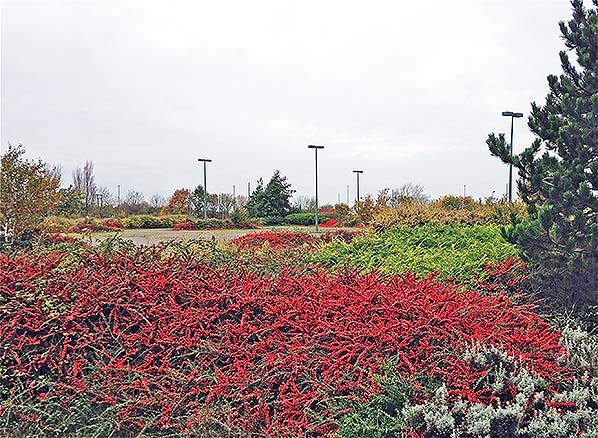 Location: Within the car park area of Pfizer Global Research & Development on the west side of Ramsgate Road. Notes: Richborough Port had a short single timber faced platform with a bench seat but no shelter on the down side of the line just west of Ramsgate Road. The station was due to open in 1925 along with other stations on the branch but the bridge over the River Stour was deemed inadequate and the company didn't receive authorisation to open the station so trains terminated at Sandwich Road and the station was never used for passenger or freight traffic. 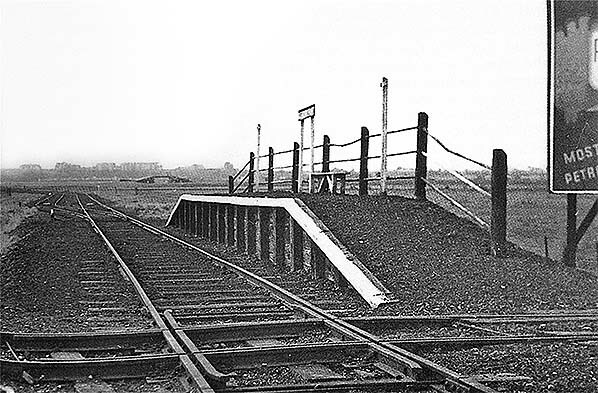 The station was sandwiched between a complex network of lines, the Richborough Port Railway crossed the EKLR on the level between the platform and the road crossing. Click here for a more detailed history of Richborough Port and its railways. 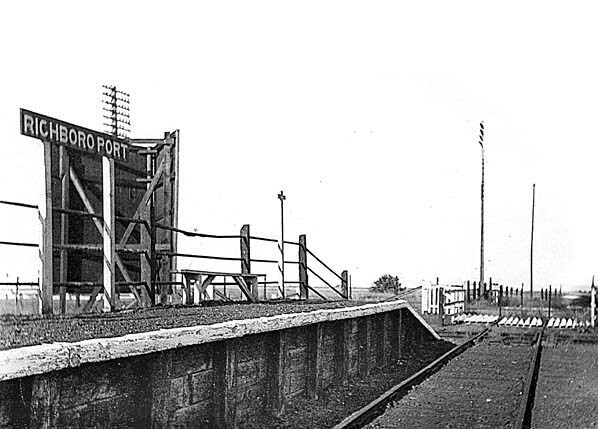 Richborough Port station - note the advertising billboard, identical to that at Sandwich Road. Passenger facilities were minimal comprising a sign and a bench seat. 1946 1:2,500 OS map. 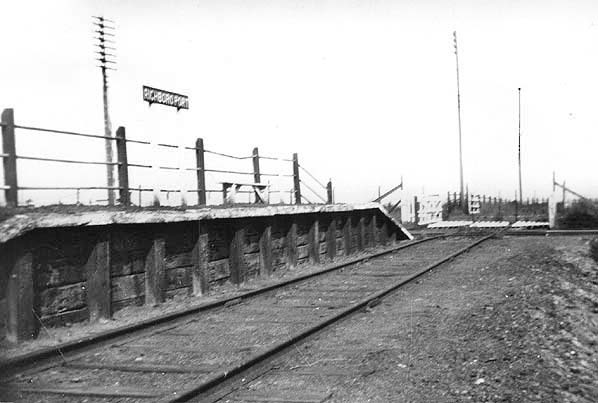 The station is names and the platform is shown butting up to the flat crossing with one of the lines of the Richborough Port Railway. Although names there is no actualy indication that it is a station. The 1931 map shows the platform but not the name. Richborough Port station was crossed by one of the lines of the Richbotough Port Railway at the east end of the platform. 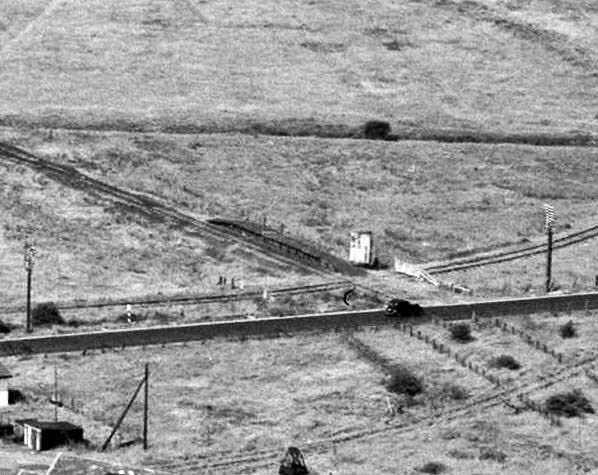 Richborough Port station seen from the air in August 1950. The approximate position of Richborough Port station. 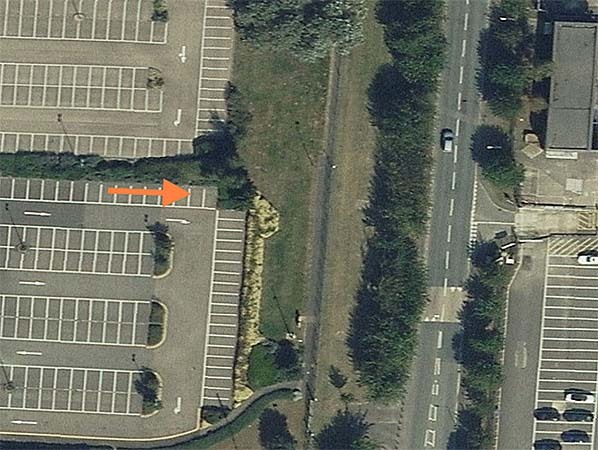 The site of the station is within the Pfizer car park with no public access. Looking east towards the site of Richborough Port station in November 2015. The station was to the right of this view. The Pfizer pharmaceuticals company have now vacated the site and the car park is currently unused.